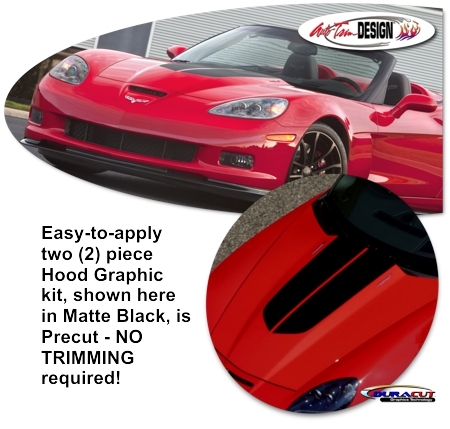 Enhance your Chevrolet Corvette C6's Carbon Fiber hood with this Hood Stripe Graphic kit. These graphics are contoured to the upper part of the C6's factory Carbon Fiber hood (most often found on Carbon, 427 and ZR1 models). They're precut and ready to install in a wide variety of colors! Each Hood Graphic measures 34.651"x 10.676" (88.01cm x 22.225cm) and is designed for center spacing of 0.875" (22.225mm) at time of installation.